Selectable dosage mode between unloading, automatic or guided manual loading. Management of the dosage on various scales (up to 4 independent). Management of the production program for dosage up to 4 formulas in sequence, with automatic selection of the following formula and automatic change of the scale. 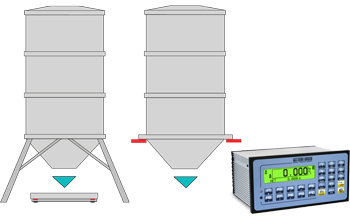 Management of the volume flow meter, for dosing in litres. Database of 500 formulas with target, speed change threshold, flight, +/- tolerance, minimum tare and maximum tare values, 2 setpoint values in weight for activation of 2 output. Manual programming of the activities and the formulas or throught PC software (Dinitools). Formula selection through 2 external inputs. Dual dosage speed (approximate and fine), through any available contacts or analogue output (optional). Analogue output (optional) proportional to the dosed weight or to the dosage speed. External Profibus interface (optional), for programming the formulas and managing the cycle. Bluetooth connection (optional), for quick wireless programming of the activities and the formulas, through PC or PDA. BATCH1 Software for single product dosage systems in loading and unloading.